Longpré-les-Corps-Saints: Twinning, after the football, the onions! As they say, you can’t choose your family but you can choose your friends, and since Longpré has chosen Eastry we must ensure that our futures are united under the banner of sympathy and friendship. With this aim in mind the President of the Longpré twinning committee Mr Jean-Luc Freré spoke to the audience at the last town meeting about a future event for the weekend of the 1st May. After plenty of discussion, this date for crossing the channel, with the hand of friendship extended (Literally in French : With the symbol of the lily) was accepted. Also outlined was the possibility of exchange visits between the pupils of our fraternal communities. Mr Jean-Luc Freré also recounted that during his last visit he was told about ‘the biggest onion competition’ organised by Eastry’s keen gardeners, and that the villagers of Longpré are more than welcome to compete. To inspire you all, to the left is a photo of this important family of monocotyledon plants taken at Eastry. Over to you gardeners of Longpré, and may the best man win! 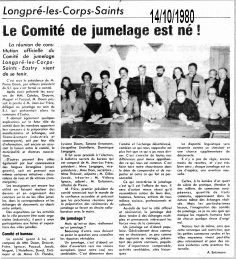 14/10/1980 Longpré les Corps Saints. We already talked about the events around the twinning between Eastry and Longpre. They will remain engraved on Longpre’s inhabitants’ memory for a long time. The success of this day has been mainly attributable to the organizers, local council of course, and also to the Tourist Information Office with its president Mr Doom and to the Twinning Association, chaired by Mr Jean-Luc Frere. They all worked very hard. And we should congratulate them, it was done in the different speeches. A meeting to officially constitute a twinning committee for Longpré-les-Corps-Saints and Eastry has just been held. Mr. Pierre Doom, who is, moreover, the Chairman of S.I., presided over the formation of the committee. After presenting apologies for absence from Messrs. Catelas, Drouvin, Muguet and Pacaud, Mr. Doom invited Mr. Jean-Luc Frère to speak. Mr. Frère, a delegate from the S.I. steering group, then introduced the village community of Eastry. At the same time he gave various details about the future role of the committee, whose members work together to prepare events and exchanges. They may offer support in financing (industry and commerce), in the field of information, or, indeed, in liaising between the committee, the municipality and various associations. Others may be equally useful through their knowledge of foreign languages (teachers), or perhaps by taking certain initiatives themselves: such as the decoration of streets and shop windows (commercial sector). Those in the teaching profession have further special roles: encouraging the completion of related homework and projects; organising competitions on the subject of the town, or towns, twinned together; facilitating pen-pals and exchanges of written work and objects between pupils. Exhibitions about the towns’ activities can also be organised (industry). There may be shared participation in festivals and exhibitions of the twinned towns. As for the Committee, its members are: Messrs. Doom, Drouvin, Frère, Ignace, Pacaud, Jacob, Muguet, L’Hotellerie, Duval, Entzmann and Mesdames Ch. Flandre, Lysiane Doom, Simone Entzmann, Jacqueline L’Hotellerie, Dominique Lengagne. The next item was a secret ballot to elect the Executive Committee whose members are: Mr Jean-Luc Frère, Chairman; Mrs Lengagne, Vice-Chairman; Mr Doom, Secretary; Mrs Thibault, Assistant Secretary; Mr Gilles Jacob, Treasurer; Mr Vidocq Ignace, Assistant Treasurer; Mr Entzmann, Publicity. Mr Frère, the first Chairman of the Committee, thanked everyone for their support and settled the details for the following meetings to prepare the twinning inauguration ceremonies in close collaboration with the Mayor. But what exactly is Twinning? Many of you must be asking this question without knowing the real answers. First and foremost, twinning is the desire to open ourselves up towards our neighbours (in our case, our European neighbours), our fellow men and women. Twinning aims to show through friendship and disinterested exchange by how much that which unites us is stronger than that which has been able to divide us. It aims to highlight and enhance all our differences in order to see more clearly what we have in common. It aims to submerge prejudice in the desire to more fully understand and respect what creates it. What characterises twinning is that it is an activity for everyone. It will succeed all the more as it develops from groups with their chosen leaders; men, women and children of every social, professional and cultural sphere. Over and above all the official and ceremonial features, twinning must, therefore, foster multiple ongoing exchanges which appeal to the living strengths of the community. Twinning is above all for everyone. Generally two communities choose each other, rather like two people who want to get married, foregrounding what they have in common: similar size populations, comparable activities, historical cities. The difference in language will be experienced positively as a stimulation and as one more opportunity for discovery. There are no rules, even less any formula, and it’s much better this way. Each twinning is unique – a new adventure. Of course, in the light of a quarter of a century of realisation, spread across thousands of European communities, certain shared characteristics show themselves in the very nature of the exchanges that have been achieved. But local features, the twinning committees’ imaginative enterprise, that indefinable something which shows in human interactions, make each twinned pair unique. All the same, let us note – without this comment in any way clipping our wings – that small rural communities and medium-sized towns for obvious reasons probably experience this adventure with our brothers and sisters far more intensely. THE COCHONNET DOES NOT GO OVER THE CHANNEL. Twins for nearly 25 years with the village of Eastry Kent (near Canterbury) Longpré twinning association received their English families who were welcomed by their French hosts in the reception room (room of honour) in the town hall. The president Alain Defebvin in his welcome speech hoped that the two villages can develop deep links through the primary schools, which was endorsed by his English counterpart Roy Marshall, inviting the Longiprates to visit Eastry next year to celebrate the 25th anniversary of the twinning friendship. There followed a wine reception (a glass of friendship) while Alain explained the itinerary, a visit to the caves of Naours followed by a picnic: the evening being finalised by a visit to Amien Cathedral and to the site of St-Leu. In addition Eastry have a petanque club, at each meeting the trophy is played for. This time it remains on picardie soil, since Longpré won the match, to the big disappointment of “Terry the Welshman” the man responsible for the English club. What we will remember of these meeting days, is a lot of friendship, mutual understanding and a clear pleasure to meet one another, and this time on British soil, really far away from the usual political divisions. A weekend of Franco-English friendship. Twinning between the communes of Longpré and Eastry, in Kent (England), created in 1980, on the initiative of an elected official of the time, is always a success. 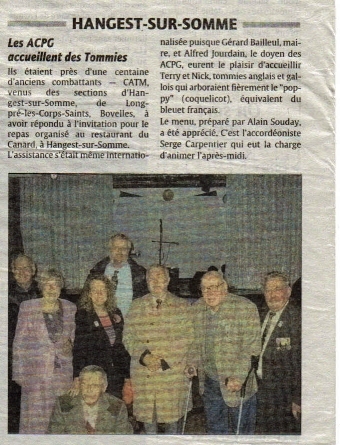 For proof, last weekend, a British delegation came over to the soil of Longpré to confirm these bonds of friendship. They were received on Friday evening, in the room of the town hall, by the mayor, Alain Drouvin. He did not fail in its remarks to underline the friendship between the two communities, before allowing the president of the Longpré committee, Jean-Marc Vermoeren to speak. In the language of Shakespeare, he recalled that this exchange has occurred for the last 27years, and then he gave a gift, in fact a painting on silk of the coats of arms of Kent and Longpré, extremely appreciated by his British counterpart, Terry James. In French, Terry James thanked his hosts for the reception provided to the members of the delegation, of which some have many years of very close links with Longiprates. During the two days, the British guests were well entertained, including an evening of folk music and dancing and a buffet, which went on extremely late into the evening. And to conclude this short stay, on Sunday morning a contest of a game of French bowls proceeded, because, in Eastry, there is a petanque club which Longiprates named at the time "the booligans". *The tournament, known as the David Skinner challenge, (so named in memory of him, a founding member of the twinning, who died a year ago: he was also named at the Municipal Council’s decision “citoyen d'honneur ” "citizen of honour"), was won by the team from Longpré, to the great distress of Terry James who promised that next year in Eastry he would recover it. 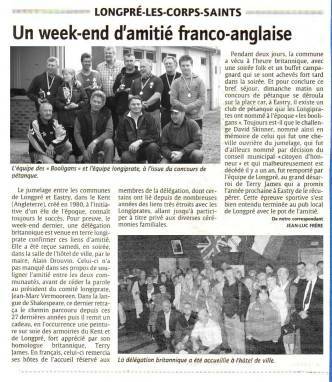 This sporting test of course finished in the local pub of Longpré with the ‘pot of friendship’. *My interpretation of the French text! [beneath photo] from left to right: the Chairman, Terry James, and Wendy and Phil Smith meet up again with Claudette and Michel Srodesky and the longiprate Chairman, Jean-Marc Vermoeren. 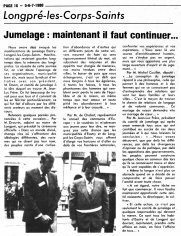 It is now 27 years since the community of Longpré-les-corps-saints was twinned with the community of Eastry, situated in Kent, 25 kilometres from Dover. The two villages have similar characteristics: both the number of inhabitants (about 1,400), and infrastructures. Since then, every year, the members of the two committees meet up for the duration of a weekend, alternating between France and England. This year, it is the Longiprates who have been welcoming into their homes their English counterparts. Having arrived Friday at around 22.00 hours, the citizens from across the Channel were welcomed with pomp and ceremony in the village reception hall, before taking up their quarters in the homes of their hosts. Throughout Saturday, everyone was free to visit the area in whatever way they pleased, according to their interests, before gathering together again for the evening, in the main hall, where the nine members of the Twinning Association committee, and their Chairman, Jean-Marc Vermoeren, had organised a dinner dance. A warm and friendly evening enlivened by the group from Amiens, “Peut qu’manquer”, and its repertoire of folk music. For Jean-Marc Vermoeren, Chairman of the Longpré committee, and Terry James, Chairman of the English committee, these get-togethers are immensely important: they facilitate all aspects of cultural exchange. Whether they have been involved from the start, like Claudette and Michel Srodeski, or just this one year, like Wendy and Philip Smith, everyone is delighted to take part in these get-togethers for a whole variety of reasons. “We have been a participating family right from the start. That allows us, among other things, to practise the language, even if we have only been to England one single time in 27 years”, the first couple confided to us. “We came to Kent very recently and straightaway joined the Twinning Committee. It opened the door for us to become integrated into our village”, indicated the second. At departure time, around 16.00 hours, everyone felt quite moved as they said goodbye to each other and promised each other to meet up again next year, in England. The A C P G welcome tommies. The menu prepared by Alain Souday was appreciated. It was the accordionist, Serge Carpentier, who had the job of animating the afternoon. 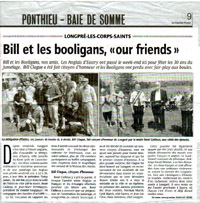 Bill and the Booligans, our friends. The English from Eastry spent the weekend here to celebrate 30 years of twinning. Bill Clague was made an honorary citizen and the Booligans showed fair play but lost at boules. [beneath photo] The Eastry delegation, their boule players and, on the right, Bill Clague, made an honorary citizen of Longpré by the Mayor, René Cailleux, with their wives on both sides. Ever since Friday, Longpré has been on English time in order to welcome the delegation from Eastry, the twinned village in Kent (near Canterbury). The two communities have been celebrating the 30th anniversary of their twinning. The English arrived Friday night, at 22.30, with, as their leader, the Chairman, Terry James. They were welcomed in the reception room of the Town Hall by the Mayor, René Cailleux, and Jean-Marc Vermoeren, Chairman of the Longpré committee, together with the host families. This was the occasion to recall the friendship links uniting the two communities and to exchange gifts. The following day, in brilliant sunshine, over 150 invited fellow guests shared a rural buffet, under a marquee, in the magnificent natural venue of the Maison des marais. On this occasion René Cailleux gave a speech. He recalled the friendship between the English and French citizens and the exchanges achieved over the 30 years. René Cailleux announced that, following a proposal from the Twinning Association, and its acceptance by the Town Council, it had been decided to nominate a new honorary citizen, while never forgetting David Skinner, now passed on, who was the first honorary citizen. To his very great surprise, Bill Clague was honoured in this way by Longpré, in recognition of his assiduity, and his devoted service in all the events which have taken place over the 30 years. He received the municipal medal and diploma, in the presence of the former Chairmen of the two Committees, Norman March, Cyril Marsh, on the Eastry side, and Jean Luc Frère, Alain Defebvin, the Longpré side. The day’s celebration was made all the more delightful by traditional Picardy games, and a guided walk through the wetlands led by French and English guides. The traditional pétanque match, the David Skinner challenge, took place on Sunday. The two teams faced each other in a warm-hearted atmosphere, viewing the victory of the Longiprates, challenging the Eastry Booligans. The trophy, encasing the ashes of a bowling ball, will therefore remain in Longpré this year. It will be the object of competition next year at Eastry, where each and everyone is here and now invited. The thirtieth anniversary of the *twinning between Longpré-les-Corps-Saints and Eastry was celebrated in Kent, in England, the last weekend. This exchange was again renewed. Within the framework of the twinning between Longpré-les-Corps-Saints and Eastry, in Kent, a longiprate delegation was received the last weekend to Eastry. The participants celebrated the thirtieth anniversary of their friendship. Everything began, on Friday, with the exchange of presents and the speeches between both presidents of the committees of twinning: Terry James and Jean-Marc Vermoeren. On Saturday, at the beginning of the morning, one official ceremonies summer organized in the church of Eastry, where the civil and political personalities of both communities, among whom the mayor of Longpré, René Cailleux, signed the renewal of this twinning. The celebration was livened led by the local flags and the children of the primary school who sang, with talent, both national hymns. Saturday evening was dedicated to the meal of close of this day in the big room of the clubhouse of Sandwich golf, a town close to Eastry, whose golf course is of international fame. The honorary president is non other than the Prince of Wales. To close these days in Britain, the players of petanque were friendly in confrontation in the courtyard of the Five Bells pub, the victory returning to Booligans on the score of 3 to 2, so allowing the trophy David-Skinner to stay on English earth this year. Then, it is with a lot of emotion that both delegations left. The next reunion between the English and French will take place on June 2nd and 3rd, 2012. Exchange of trophies between the players of petanque. The English club, The Booligans, regained the trophy David-Skinner which will stay, this year, on British soil. On Sunday before return in France, during the separation with the friends of Eastry.